The coach didn’t just go to Afghanistan to serve Christmas turkey but to help the soldiers in the war effort, too! Ever wonder what an autographed artillery shell signed by Don Cherry would be worth on eBay? So begins Joe Warmington’s column in Sunday’s Toronto Stun.and on the front page a full colur shot of the hockey clown and Canadian soldiers in Kandhar holding an artillery shell. What a beautiful way top inspire kids about the peace in this season of Isaiah’s vision of turning swords into ploughshares. Not to mention the birth of the nonviolent Jesus. Bad enough that the CBC gives this oaf free air time to spew his racist comments and his pro-war crap, the good old STUN shoves it in our faces. And these poor cannon fodder troops naive enough to believe they can build a nation and make war at the same time. Thanks Stevie Harper. LBJ said it best: you can’t have guns and butter. No it was Jesus who said it best: love our enemies and put away the sword. So reads the sports page these days. A Toronto Maple Leafs fan who threw waffles on the ice at the Air Canada Centre has been barred from the arena for his actions. Joseph Robb,Age 31 of Oakville, Ont., was charged with criminal mischief and barred from the arena for throwing waffles on the ice at a Maple Leafs game. It was done to protest the team’s performance this season. Toronto is 12-17-4, good for just 28 points. That ranks them 28th out of 30 NHLteams. Maple Leaf Sports & Entertainment vice president Bob Hunter says Robb’s actions Monday night were inappropriate. MLSE has banned Robb from other MLSE events at BMO Field and Ricoh Coliseum. Hunter says MLSE bars one dozen to two dozen fans a year because of bad behavior. Joe loves the Leafs to death. The guy is 31! And he’s dressing up and tossing waffles on the ACC ice. Now you know why the Tories are still the government and Rob Ford is mayor of Toronto. And football season in the USA is rolling again with those 31 year old cretins going ballistic. Well, my father used to say, “De mortuis, nisi bonum” About the dead speak nothing but good. In the end however truth needs a hearing as well. Not to be found in the official corridors of American power or the mainline news organizations. Case in point the sickening tributes by Barack Obama and Hilary Clinton on behalf of the recently deceased Richard Holbrooke.The gap betwen reality and fact ofc ourse is usually glossed over in the emiddle of the American empire so I guee we should have expected it. It is, of course, a very sad day here at the State Department. We have lost one of our own and a legendary figure in Richard Holbrooke, who could fill a room, including this one, as he did many times and took great pleasure in engaging the press in advancing whatever it was he was working on, whether it was peace in the Balkans, you know, peace in Congo as U.N. ambassador, or most recently, peace in South Asia in the context of Afghanistan and Pakistan. No mention of course of Holbrooke’s lifelong service to “American interests” and when they collided as they most often did with fairness, justice, compassion and the common good, Holbrooke opted for thuggery and murder. fresh out of Brown University in the 60’s Richard Holbrooke cut his teeth as Henry Kissinger’s spear carrier in Vietnam. This was a mere prelude to his dirty work in the genocide in East Timor (76-80) where a third of the population was killed with American blessing. For this alone Holbrooke was a war criminal. Holbroke was a pure hawk, a right wing Democrat who facilitated “US interests” wherever he went. A loyal tribune in the empire’s army. As the great journalist Jeremy Cahill summed his career up” He was a war maker and was someone who extended the tentacles of U.S. foreign policy. 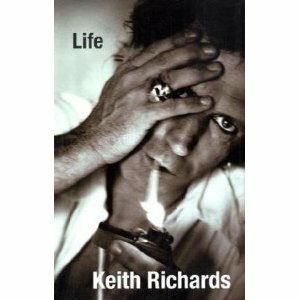 Keith Richards, the Rolling Stone front man has finally recorded his thoughts on his career so far and LIFE, the name of the tell all book is flying off the shelves. And it is quite a good read. The queston is why people would read such a book. Most probably those who would pick this book up are music buffs and would be interested in “the world’s greatest rock and roll band.” Harmless enough one would think.An entertaining read at least. So as the teacher I always tried to know the culture, what drives it, what are its values, how is it impinging on my students. And so I read “Keef’s ” story. It illuminates on several levels. The musical bits, particularly Richard’s homage to the gritty Chicago blues and R and B are wonderful—Muddy Waters, Howling Wolf, Jimmy Reed, Chuck Berry,Little Richard were my own musical heroes and of course the architects of modern rock and roll. A generous doff of the hat here. As a sociological tome LIFE lights up postwar Britain, the hard times, the ongoing poverty and in Richard’s area the hardscrabble far east end of London, Dartford the author paints a grim picture of how one’s environs shape one life. Dartford was prime Labour territory which was served by post war MP,and Prime Minister Clement Atleee. Unwittingly Richards shows us the crippling effects of such circumscribed lives and in his own case he portrays the sad effects of his totally irreligious upbringing. Particularly hard on the Catholic clergy too. This was not unexpected—but it was sad.And unlike Bono and Springsteen who internalized much of the Catholic social justice ethos while rejecting the fringes, poor Keef shows us why he never used his celebrity for the common good.Nemo dat quod non habet as another theologian Aquinas said (“Nobody can give what they do not have”) LIFE was an interesting read but in the end, Keef as Gandhi said, had no scripture, no deep story to guide him. Toronto once again has become the laughing stock of Canada with a new clown in the mayor’s chair.We thought Mel Lastman was embarrassing. Wait until you get a whiff of Rob Ford, a councillor who regularly was outvoted 38-1 on city hall votes. An independently wealthy right wing Tory, Ford claimed the chair with a successful “clean up city hall” rant bought by the gullible citizenry—or “customers” as the Mike Harris clone now calls citizens. Here’s a guy who claims no office expenses, lives in a million dollar home and goes after nickel and dime councillor’s office expenses and rings the popular “taxes” bell and people buy it. People do not want to pay taxes and resented former mayor David Miller’s surcharge on licenses.They were obviously unaware that the Tory government gives no money for transit here—the only major North American city which does not get a huge subsidy to ferry its citizens around.You can’t run a major city on no revenue.The oafish Harris government downloaded major expenses on Metro Toronto.Try and be mayor and run a major city with the services people expect without taxes—the price we pay for a civilized city. Let’s become America the global leader in every social pathology by refusing to pay taxes.Where do people think the money comes from to build a great city? And now we have Rob Ford who dishonors the citizenry by importing hockey clown Don Cherry to invest him with the mayor’s chain.One would expect a somewhat solemn occasion. Guess again.Even the right wing rag The Toronto Sun called hm out on this cheap piece of street theatre. 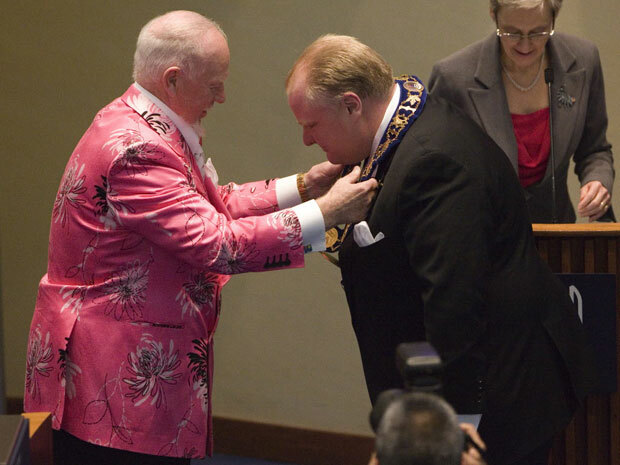 On his first official day as the Mayor of Toronto, during what should have been a ceremony to promote conciliation and collaboration, Rob Ford further entrenched divisions by inviting Don Cherry to place the chain of office around his neck. Cherry may be a prominent Canadian figure, he may be loved by many, but he is irrelevant to Toronto’s political process. If his rant is a sign of things to come from Team Ford, then we are headed for a tumultuous four years.